WordPress is a blog platform. But did you know it can be used as much more than that? You can use WordPress to run just about any kind of site you can imagine — blogs, static-looking business sites, forums, directories, membership sites, and more. With flexible templates and a huge collection of available WordPress plugins, it’s really capable of serving as a fully-functioning content management system (CMS). One of the biggest benefits of using WordPress to manage a business site or professional portfolio site is that a single installation can manage both a static-looking professional website and a fully-integrated blog. 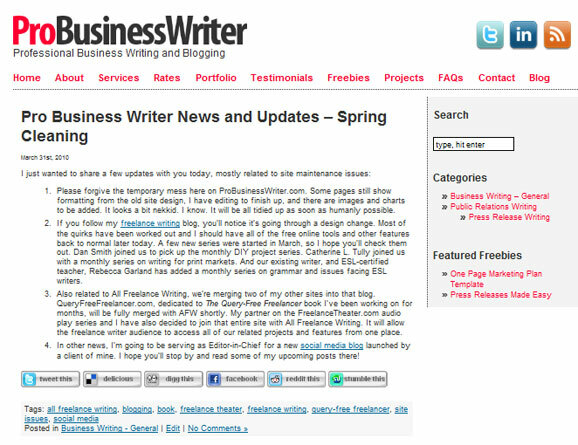 The blog doesn’t have to appear on the homepage, and the pages on the site don’t have to follow the blog’s formatting (such as listing blog categories in the sidebar). Let’s talk about why this combination (or hybrid) type of WordPress site can be beneficial to business owners and independent professionals. Then I’ll share an example (my own business site and corresponding blog), including some tricks and tweaks you can use to achieve the same thing as simply as possible. Why Would You Want to Run a Hybrid Site on WordPress? You only have to login to one administrative panel to update everything on your site and blog. You only have to make design updates to one site and one set of template files (or one stylesheet) rather than doubling your work by having to repeat it on the main site and then the blog separately. You can update everything online — no need to update your static portion offline and upload the changes each time. You can easily integrate dynamic blog information (like your latest post titles) onto static-looking pages. It’s really about simplicity and flexibility. If you want those things, a hybrid WordPress site and blog might be a good option for you. Now, on to the next question: how do you set it up? You can see screenshots below of the current homepage, an internal page, and the blog layout. I went with the simplest options I could think of at the time to make the site and blog appear the way I wanted them to. Here is a step-by-step look at how you can do something similar (assuming that you already have your self-hosted WordPress installation setup — if you don’t, follow these 5-minute WordPress installation instructions). Note: This tutorial assumes that you understand basic HTML and CSS, as you’ll be editing your stylesheet and template files for your WordPress theme. If you’re a complete newbie to coding, your best option is to hire a designer to create a completely custom site for you, or hire a coder to handle alterations on an existing theme. Choose a theme (any theme) and install it. — You can create a combination static site / blog for your business using any theme you want. You can use free WordPress themes. You can use premium WordPress themes. You can use a custom design. Just choose one that you like and install it. If you aren’t sure how to install your WordPress theme, follow the instructions that came with your theme — often in a Readme.txt file — or follow the instructions from WordPress.org on adding themes to your WordPress installation. Create the actual homepage. — Once your homepage template is ready, it’s time to create the actual homepage. Do this in the same way you would create any WordPress page (not post). Just click the “add new” link under the “Pages” heading in your WordPress admin area’s sidebar. Here you’ll add the text and images that you want to appear on your homepage. If you created a new homepage template, look for a drop-down menu on the “new page” form while you’re writing that text. It will be under a heading called “Template.” This tells WordPress what page formatting to display this particular content on. Set it as your front page. — Once you’ve created your homepage and added the content or marketing copy, it’s time to tell WordPress to use this page as the front page on your site (instead of displaying the blog automatically). 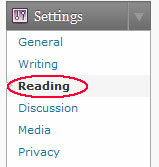 Under the “Settings” menu in the sidebar of your WordPress admin area, click on “Reading.” You’ll see an option to use a static page for your homepage. Tick that option. Then choose the new homepage you setup from the drop-down list next to where it says “front page.” You’ll also notice a “posts page” option. That’s the new location where your blog will display since it’s no longer going to show up on the front page of the site. We’ll create a new page for that next, so just leave it alone for now. 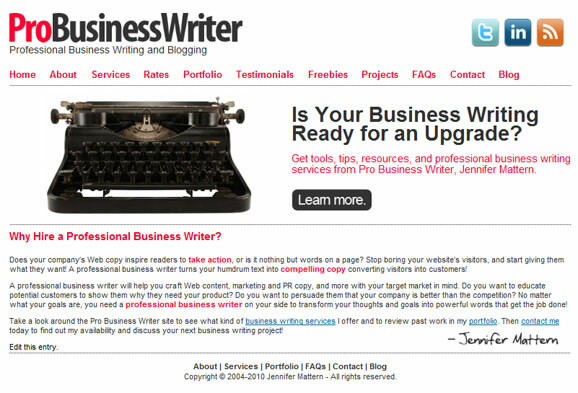 Create a blog page. — Create another page. Call it “Blog” or something similar. You shouldn’t have to change the associated page template for this one. This is the template your blog’s main page will show on, so you’ll still want it to include the sidebar information more than likely. Set the default blog page. — Go back into the “Reading” settings. Now you can choose your new “Blog” page from the dropdown list next to “posts page.” This will add a “Blog” link to your page navigation on the front-end of the website (where will depend on your theme; each theme is different). That’s really all there is to it! You’re just creating two pages, changing two settings, and possibly adding a new homepage template file if you want the homepage to look different than everything else. Now you’ll have your customized homepage showing up when people visit the main page of your site. They’ll be able to browse your pages like they could on any static website, and they can access your blog posts simply by clicking a link in your navigation. Very easy. If you’re well-versed in WordPress sites, PHP and CSS, you can pretty much make the entire site work in any way you please. Even if you’re a relative beginner though, you can still very easily have a static homepage on your business site while still featuring a blog. Do you have a combination professional site / blog hosted on WordPress? Share a link in the comments and show us! Great article,Wordpress rocks… WordPress was born as a blogging platform, but today it is much more than that, thanks for the tutorial. rally useful article for me I am not too technical but it gives me lot of knowlege. so I will try to create my own site like this. thanks man keep it up. Very timely post—I’m just in the process of consolidating my website and blog. What really bugs me, though, is that many WP templates are so complicated that a simple task like making the stylesheet do what you want is almost impossible. It seems developers don’t have any standardization in how they name things. Or the same type of item (such as font) is defined in so many places it takes ages to hunt down the inheritance order. @Jenn-I love the simplicity of the instructions. 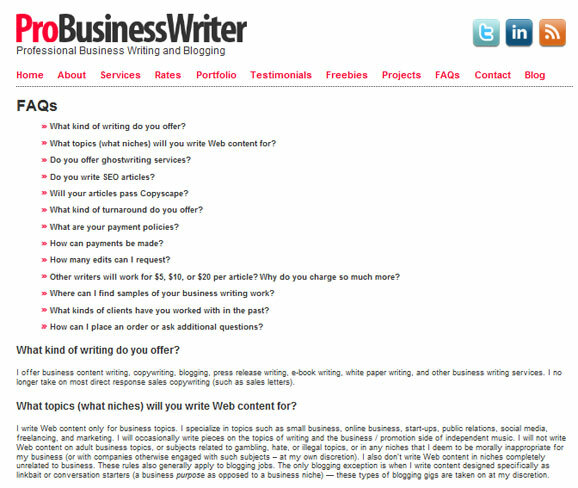 I created my business site/blog at the beginning of this year & wish I have these instructions. @Kimmo-something that worked for me is you can get WordPress themes where they include basic editing that override what’s programmed-things like Font size, color, headers, etc. They make if much simpler. On my site, I actually purchased a theme. On my health care blog, I used a theme called Basic Simplicity by Michael Janzen that is very easy to use. If you’re not familiar enough with the code to edit things easily, what Cathy suggested is a good idea — go with a framework theme that lets you control these things in your admin area instead. I know what you mean about nonstandardization. Not sure I’d call for everything to be the same as I can usually find what I want anyway. But on the rare occasion it’s a real pain I just go into the template file, find the info I want and see what it’s wrapped in. That tells me what to look for to make changes in the stylesheet. It gets frustrating if I have to do that a lot, but on the rare occasion I do it’s only for a section or two. WordPress is a blogging platform. But i knew know that can be used much more than that. You can use WordPress to run almost any kind of site you can imagine blogs, business sites to static electricity research, forums, directories, membership sites and much more. Hi — I’m a raving fan of WordPress for websites. But you all bring up a good point — unless you are comfortable changing stylesheets (and child themes) setting up a custom look might be too technical for some. If you brand it well, you can use it. The trick is knowing what to change as far as appearance and the default settings. One of the easiest ways to have a “static” page is when you go into your WordPress Settings change the first page from “recent blog posts” to a specific page that you have formated for welcoming. It is important to note that a static welcome or “splash” page is quickly becoming a thing of the past as people want right to the fresh content and not having to click through to get there. We are in a time of “give it to me now”. Congrats on the switch and new site! Thank you so much, Alaina, for replying to Maxwell and letting him know how static welcome pages are created in WordPress blogs. I really appreciate you taking the time to assist him.